It’s kind of bizarre, but I crave buffalo sauce all the time. All. The. Time! Buffalo-style baked cauliflower is usually what I opt for to curb my cravings in a somewhat healthy way. 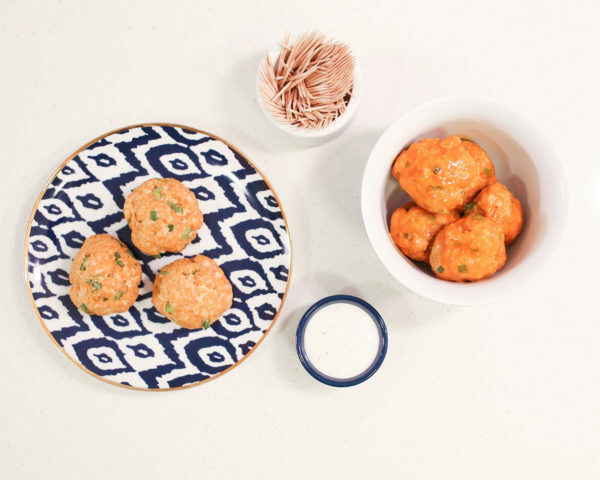 Baked turkey meatballs are always one of my go-to recipes for weeknight dinners. I tend to make a batch at the beginning of the week and heat a few up with a large serving of veggies for dinner. But when my grocery store was out of ground turkey a few weeks ago, I bought ground chicken instead… *lightbulb moment* I decided to wing it (no pun intended) when I was making my weekly meatballs and make them spicy instead! Unless I’m cooking something new, I’ve never really been into following recipes. I generally just whip up what I have and eyeball things. My general meatball recipe is 1lb of meat, 3/4 – 1 cup of breadcrumbs, 1 egg… Then I just experiment adding random things to see what I like! 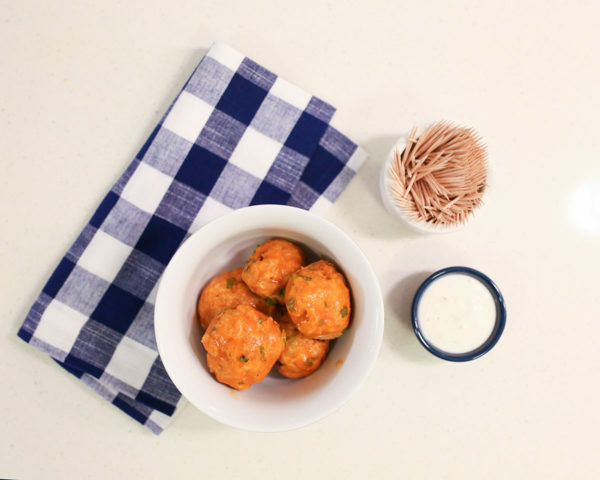 My baked buffalo chicken meatballs turned out to be SO. DANG. GOOD. I pretty much licked the bowl clean! With Superbowl Sunday this coming weekend, I figured I would share the recipe if you’re looking for a lighter option than chicken wings that is just as tasty! A little greenery… Since I came up with this recipe, I’ve poked around for others to see if I was missing anything. Most other recipes I’ve found use chopped celery, which would certainly be an option. (There’s a reason it’s always served on the side of wings!) I haven’t tried making them with celery yet, but I think they taste great with the green onion. For the breadcrumbs… I’ve made them with the Glutino Gluten-Free Breadcrumbs and the generic Whole Foods 365 Whole Wheat breadcrumbs. Both were great! I eat mine as a meal with a fork, but if you wanted to serve as an appetizer, you can set them out with toothpicks! 1. Preheat your oven to 350! 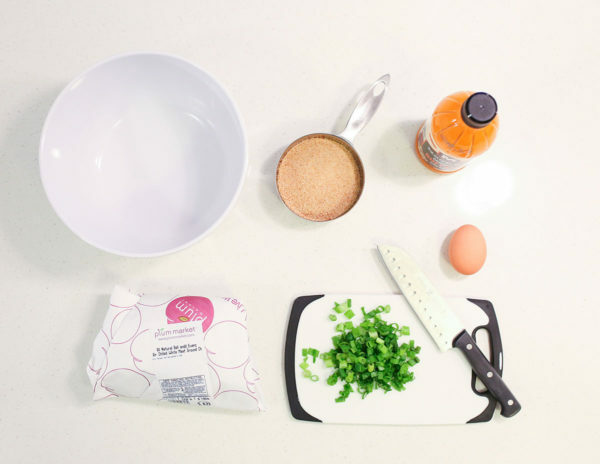 Break the egg into a medium-sized mixing bowl. I use a fork to break the yolk and lightly whip the yolk and whites together. 2. Add your spices to the egg and mix thoroughly. 3. Add your ground chicken to the bowl. Make sure the meat is evenly coated with the egg! 4. Add the buffalo sauce and chopped greens and use a fork to stir until evenly mixed. 5. Slowly add your bread crumbs! 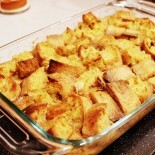 Continue to use a fork to mix in the breadcrumbs. I try to use as few breadcrumbs as I can, so I will fill a dry measuring cup with 1 cup of breadcrumbs and sprinkle them in, bit by bit, until the mixture starts sticking to itself like a ball. You’ll know when you have enough or still need to add more! I usually end up using somewhere between 3/4 cup and 1 cup of bread crumbs. 6. I put a piece of foil down on my baking sheet and lightly spray it with olive oil. I wash my hands (again) and lightly coat them with olive oil, too. 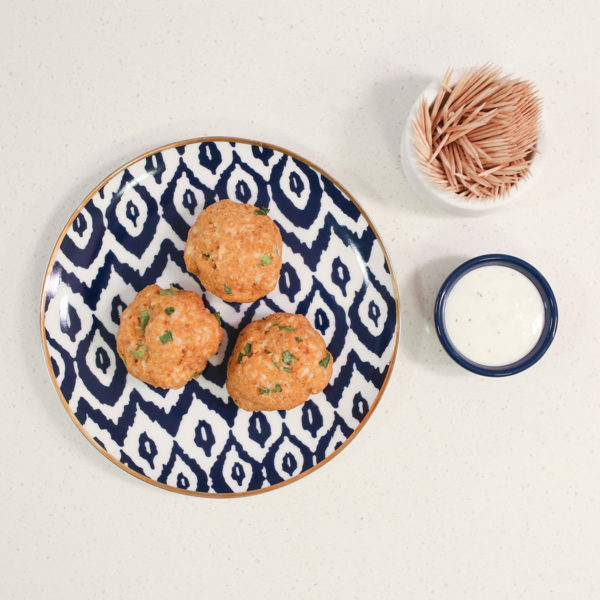 (Just like I would put on hand cream…) I use a spoon to scoop out a meatball and roll it into a ball with my hands! 7. Bake at 350 degrees for 20 minutes. 8. Like I mentioned, I’m a big fan of buffalo sauce so I actually lightly coat my meatballs in my favorite buffalo sauce once they’re finished. If you don’t like as much of a kick, leave them as is. 9. Don’t forget to dip them in the ranch dressing! Enjoy! Let me know if you end up making them and what you thought! PS: I share a lot more of my cooking adventures on Snapchat so add me there if you’re interested. My username is JessicaSturdy. I love this post so much!! 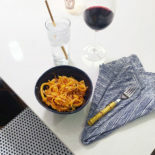 Your recipe was so clear and I loved how you gave specific recommendations. Can’t wait for your smoothie recipe!! This recipe looks great. I started using ground almonds in meatballs and burgers as a substitute to breadcrumbs – to save carbs and I really dislike the taste of a lot of breadcrumb mixtures and it is amazing. You just pulse salted roasted or raw almonds in a food processor and use them the same way you would use the breadcrumbs and it has the same effect – just with more protein and more healthy fats. I bet it would work really well in this recipe too! I know what I’m making this weekend! Thanks for sharing. Looks so good! 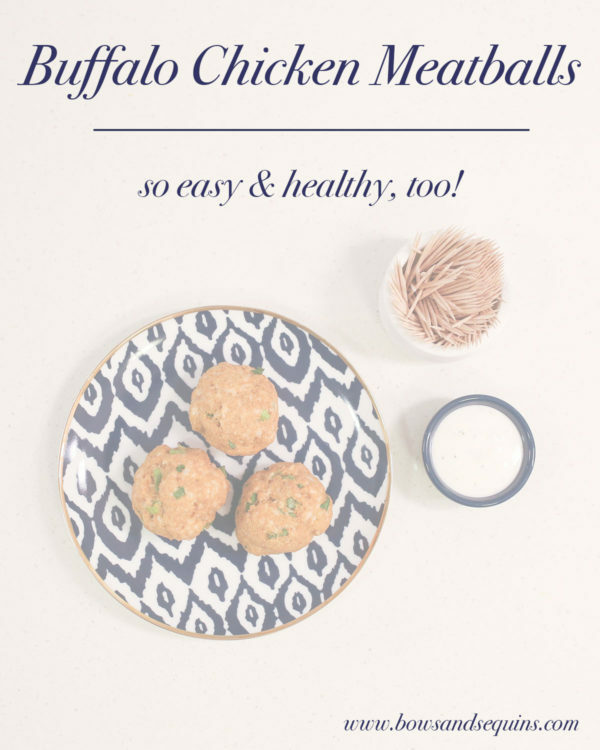 Oh girl this is right up my alley, I have a buffalo chicken addiction! I also love those Bolthouse dressings. I love doing green onions instead of celery too. OMG the Bolthouse Farms dressing is seriously to die for. I also love their Cilantro Avocado and use it for my taco salads! NOM NOM NOM! These look so easy even Ed can make them. Great idea for lunches too! Just tried this ranch dressing thanks to your recommendation – sooo good!! I can be a little ranch obsessed at times and love that this one is low calorie while still maintaining that ranch taste! 🙂 Thanks for sharing! YAY, so glad you love it!! It’s the best. Thank you so much for posting this recipe! I made these for Super Bowl and everyone raved. They were so simple to make and your directions were so clear and easy to follow. I did swap in celery instead of of onion for a nice added crunch. Curious though- how many did you get? I wasn’t sure how big to make them and ended up getting 19 meatballs. Yay, so glad to hear!! I get about 12 meatballs, but I make them bigger for meal-sized portions. (I usually eat about three with some veggies for dinner!) … 19 is probably pretty accurate for more snack-sized bites! Where else may just I get that kind of information written in such an ideal means? Will definitely be trying this! 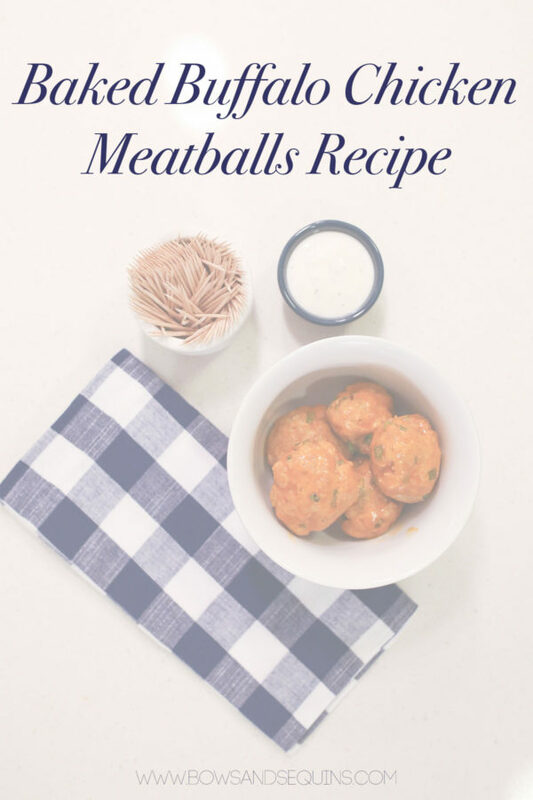 Honesty time… I’ve never tried making my own meatballs. They’ve got to be a million times better than the ones from the freezer section of the grocery store! Made these today for lunch! Love them! Yay, so glad you love them! They’re the best.